Love the unputdownable sweets at this shop specially the Saeo paak, Karachi Halwa & the dhodha. YUMMRAJ’s advice – Take a metro ride to Chandni chowk. 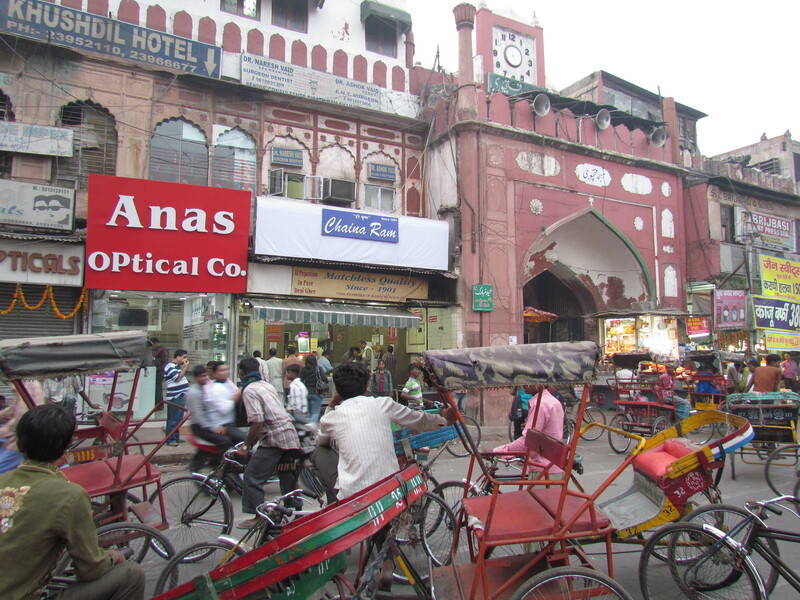 Once u r out, come to the main chandni chowk road & take a rickshaw ride to Fatehpuri Masjid. Avoid taking ur car. 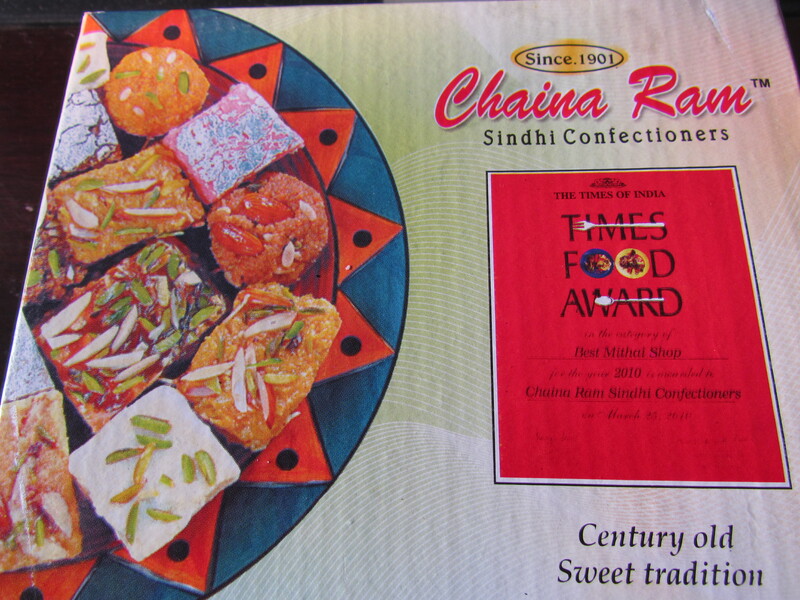 This Sindhi Sweet shop has been around for more than a century & that speaks a lot (though not everything). The shop front is perennially full of customers. What draws one’s attention is the immense number of interesting signage on the wall. In most of my visits I have come across the owner who sits in the shop & that makes a real difference to the quality of the sweets & also to the overall management of the place. At times the place can be overcrowded & one might have to wait for 15 – 20 minutes as well!!! I guess it wud b better if the shop introduces a queue system – that wud make things easier for the customer but might take away the warmth of conversation with the people at the shop. 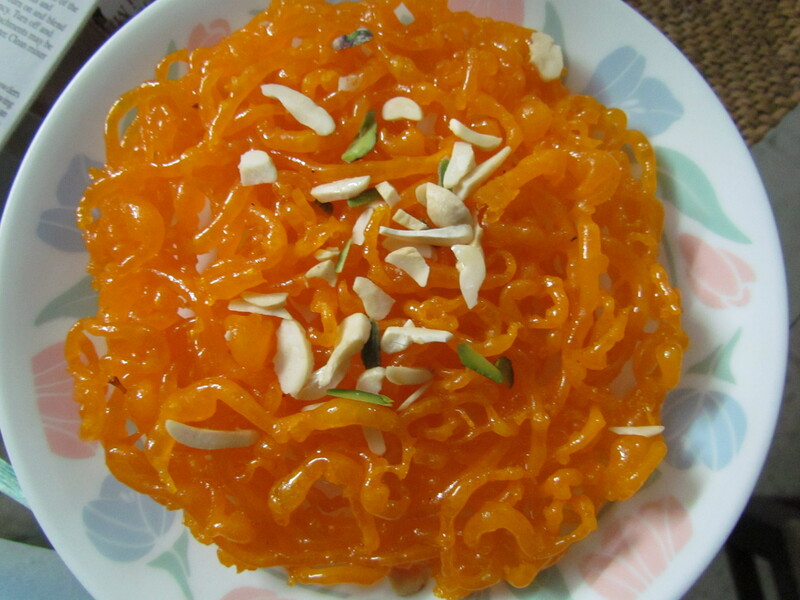 All sweets r made from pure desi ghee & the best of ingredients. The desi ghee bit is mentioned on the wall & is obvious as soon as u eat the sweets. The ‘ingredients’ part also becomes obvious as soon as u pop the sweets into the mouth. ‘Please do not refrigerate our sweets’ claims the sweet box & this is reiterated also by the people in the shop. 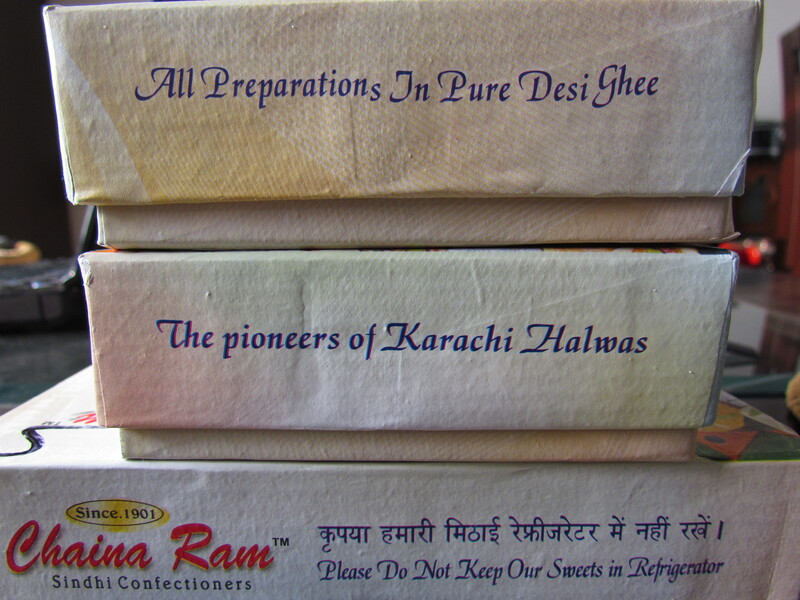 The shop is known for Karachi Halwa. Like all halwas it is made of pure ghee & a regular dosage of this is surely to increase ur waist & weight by significant proportions. I have an interesting way around this – I believe in eating everything that is tasty & later working out. 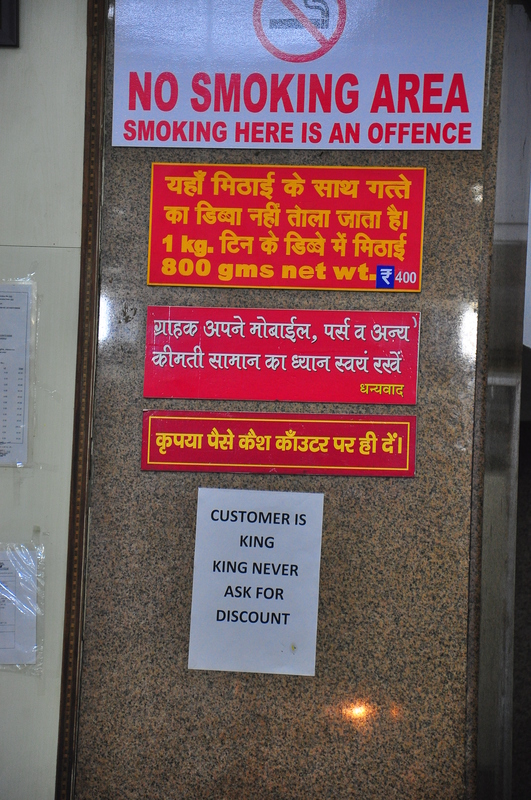 That principle motivates me to eat sweets at Chaina Ram. The Halwa unlike in most other places is less sweet (enjoyable) , less chewy ( surely welcome) & has no food color. 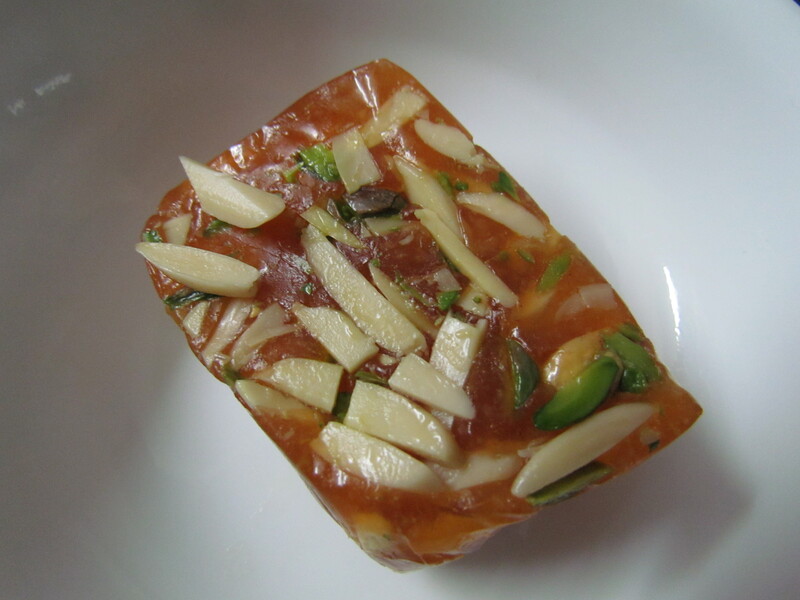 I love this halwa as it is. However, if I am having it at home, I microwave a portion of halwa for 15 seconds & the texture becomes super soft, very mildly chewy & the best possible. Saeo paak (seo/seow paak) is another sweet that I love here. The ones at Bikanervala r no match to this. 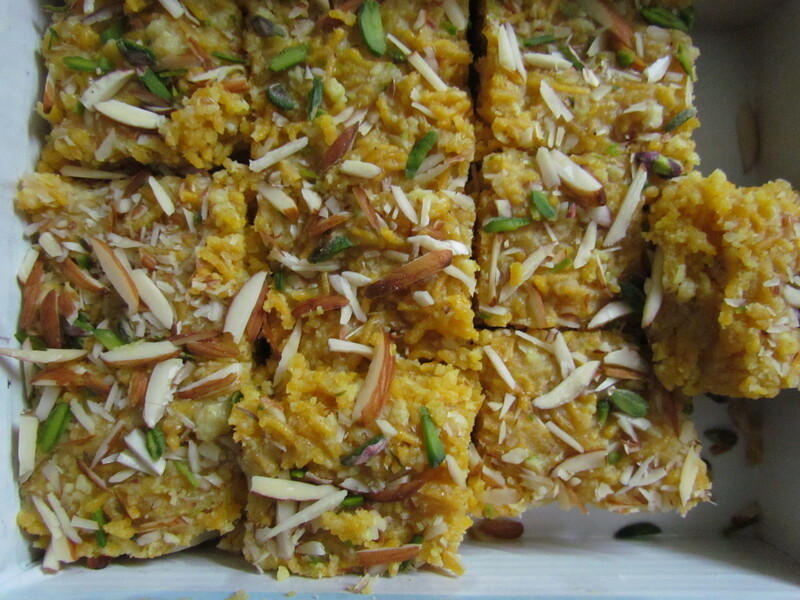 The sweet is made with seo (usually used for making namkeen). Dry fruits are used to garnish. The taste & texture is unexpected as well as excellent. 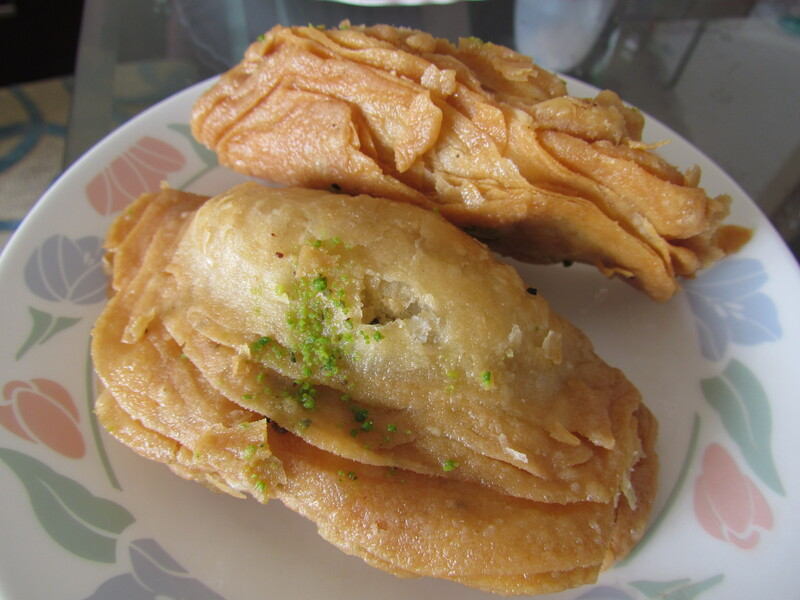 I was a fan of Dhodha at OM sweets from many years till I discovered Kishu di Hatti. 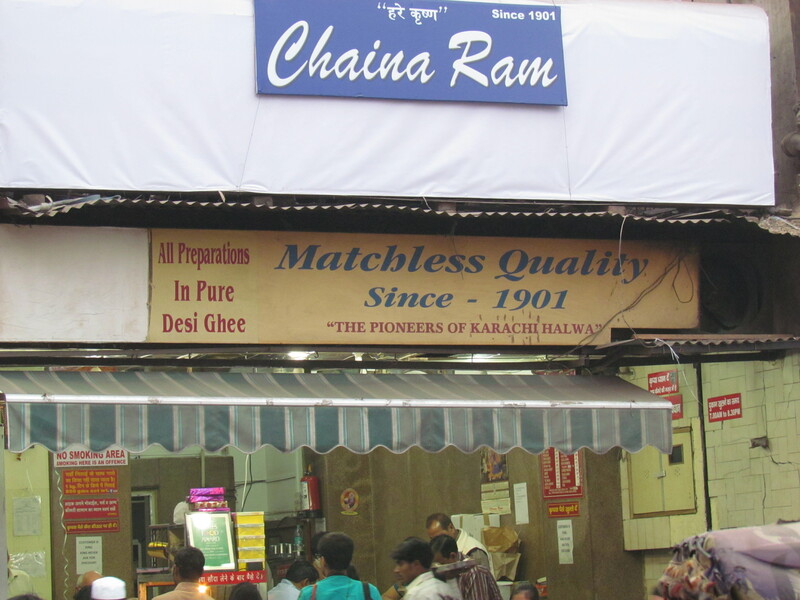 After eating Dhodha at Chaina Ram, I have changed my opinion & I think this is the best Dhodha I have ever had. 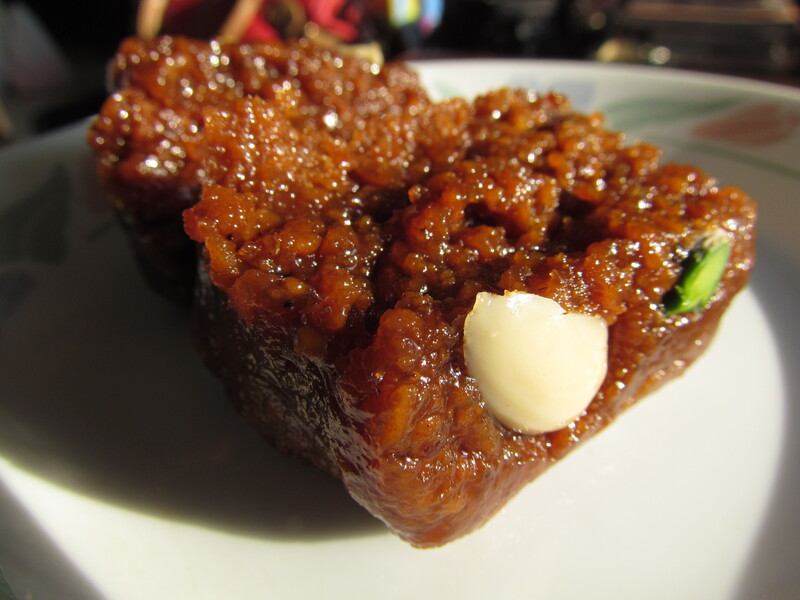 This one is least sticky, more intense in taste & flavor & is optimally sweet. I like to have this after a 15 second microwave (1 piece). 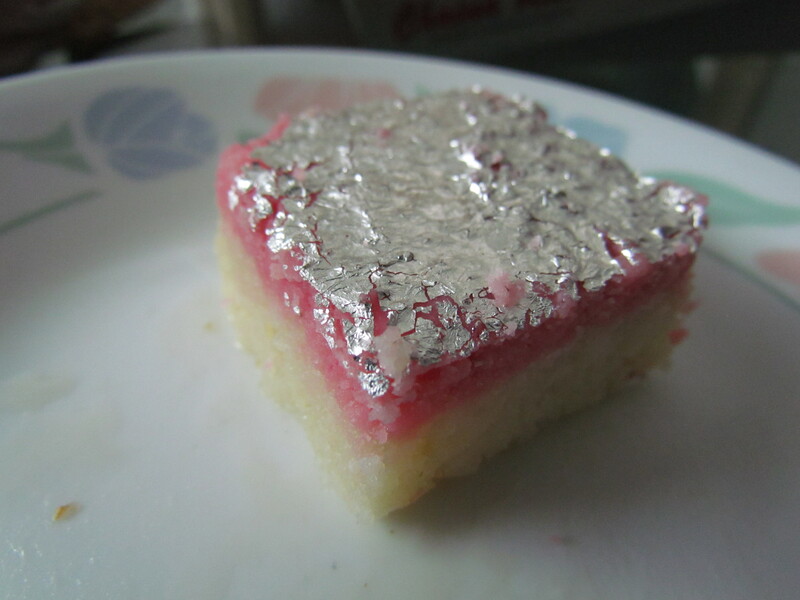 This time while we were buying sweets, the owner suggested a coconut barfi. Usually coconut barfis r of a certain pattern – sweet, non creamy & shredded coconut all over the mouth. The one at Natraj was however way superior – its mawa content was much higher thus making it softer, creamier & optimally sweet. However, the flavors of coconut were fully intact. Loved this as well. Have tried many more sweets in this shop over the years. Almost nothing has been disappointing but the ones mentioned above have surely been the winners. Probably that is why we keep going to this shop over & over. Went here 2 weeks b4 Holi & what do we see? Huge sized Holi Ghewar. No they r not ghewars but mammoth jalebis with more intricate twists & turns than Indian politics!!!! The taste is excelent – a tinge of fermented sour, not overtly sweet, not dripping with ras & just too crispy. They said it lasts crispy for 3 days. Loved it…………..
We also had one of the best Holi time Gujia that I have had in my whole life. 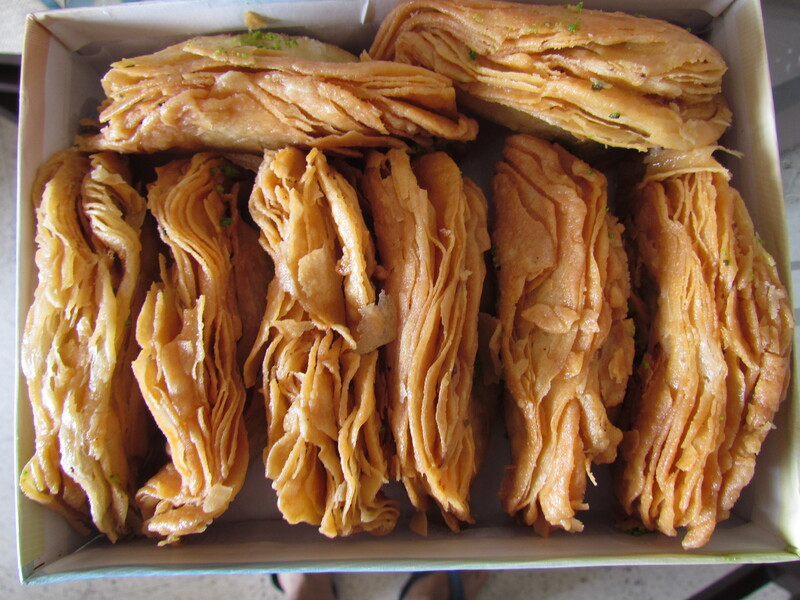 Super crispy outer, super flaky, tight filling of mawa, dry fruits, spices, no dripping ras & just too good…………….ah ha ha. 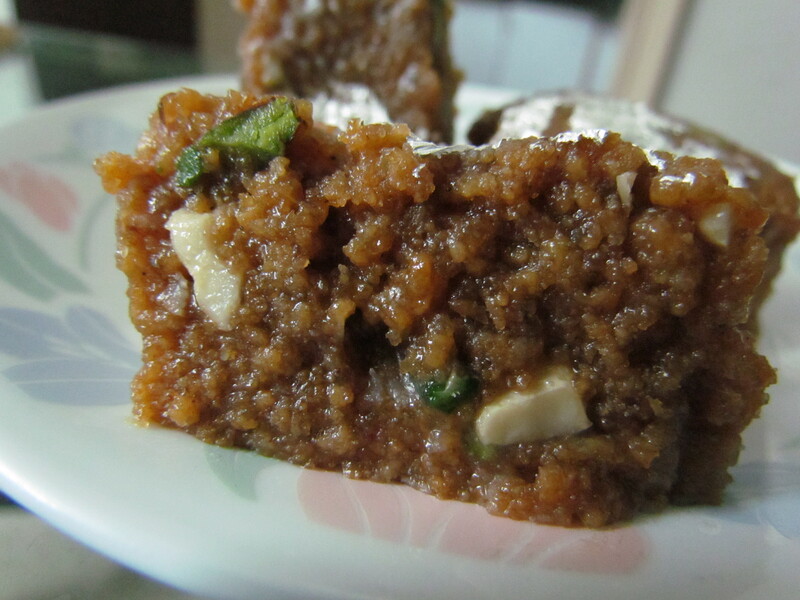 Habsi Halwa – We tried this Winter special item recently. Like most other sweets here it was simply awesome. 20 sec heating made sure that it was soft & daanedaar. It had an intense taste that was simlar somewhat to a dhodha but different as well. Super loved it. totally nai:) in looks & taste as well. 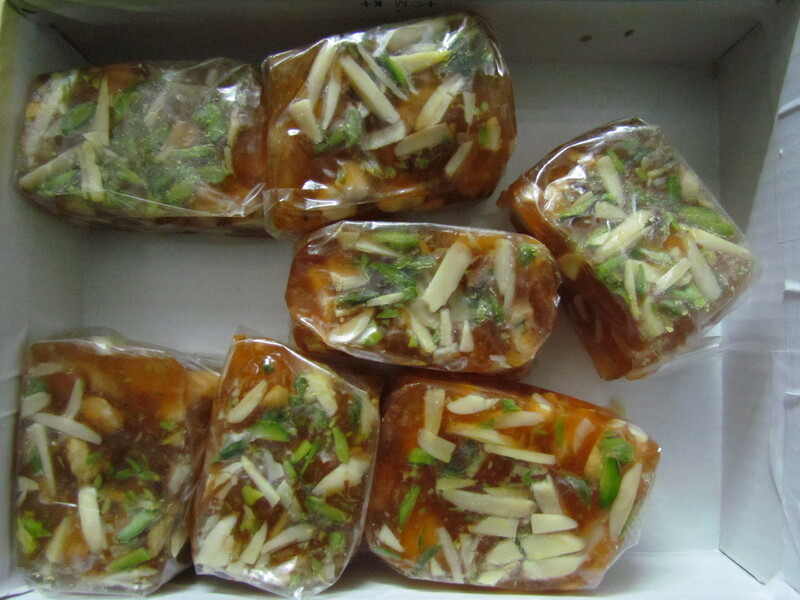 Friends, Chaina Ram’s famous mithais goes online!! Do not forget to share and like!! 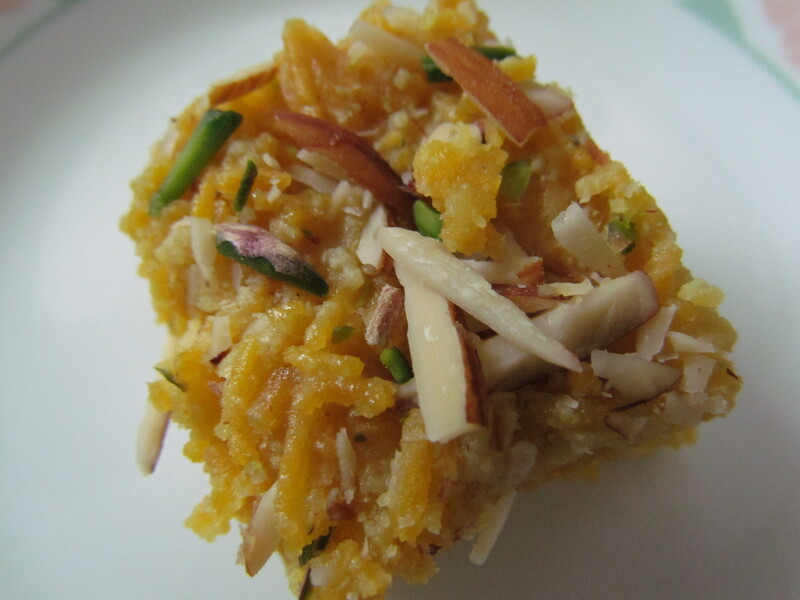 The best traditional mithai No one can do better Each mithai is best .